Euripides and Sophocles and many others have said of her that she boasted that she excelled the Nereids in beauty. For this she was put among the constellations, seated in a chair [?] (original Latin). Leaving innumerable nations behind, below and around him, he came in sight of the Ethiopian peoples, and the fields of Cepheus. There Jupiter Ammon had unjustly ordered the innocent Andromeda to pay the penalty for her mother Cassiopeia’s words (original Latin). For Cassiepea, the wife of Cepheus, vied with the Nereids in beauty and boasted to be better than them all; hence the Nereids were angry, and Poseidon, sharing their wrath, sent a flood and a monster to invade the land. But Ammon having predicted deliverance from the calamity if Cassiepea’s daughter Andromeda were exposed as a prey to the monster, Cepheus was compelled by the Ethiopians to do it, and he bound his daughter to a rock. When Perseus beheld her, he loved her and promised Cepheus that he would kill the monster, if he would give him the rescued damsel to wife. These terms having been sworn to, Perseus withstood and slew the monster and released Andromeda. 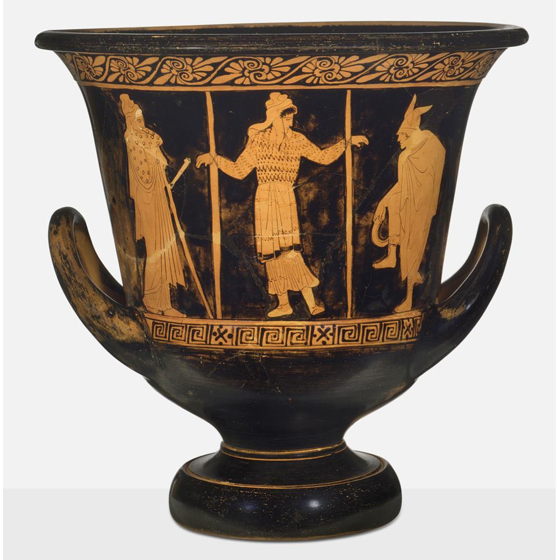 However, Phineus, who was a brother of Cepheus, and to whom Andromeda had been first betrothed, plotted against him; but Perseus discovered the plot, and by showing the Gorgon turned him and his fellow conspirators at once into stone (original Greek). forever shall be guilty as in life (original Latin). Cassiope claimed that her daughter Andromeda’s beauty excelled the Nereids’. 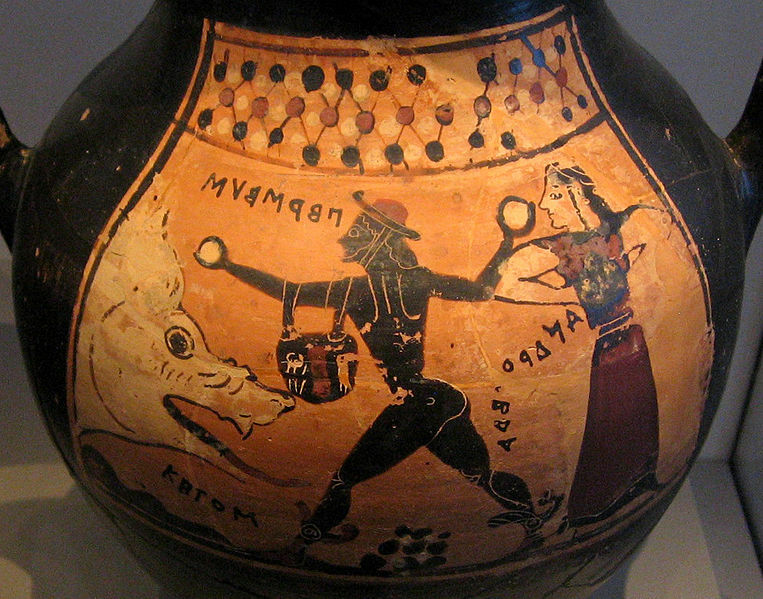 Because of this, Neptune demanded that Andromeda, Cepheus’ daughter, be offered to a sea-monster. When she was offered, Perseus, flying on Mercury’s winged sandals, is said to have come there and freed her from danger. When he wanted to marry her, Cepheus, her father, along with Agenor, her betrothed, planned to kill him. Perseus, discovering the plot, showed them the head of the Gorgon, and all were changed from human form into stone. 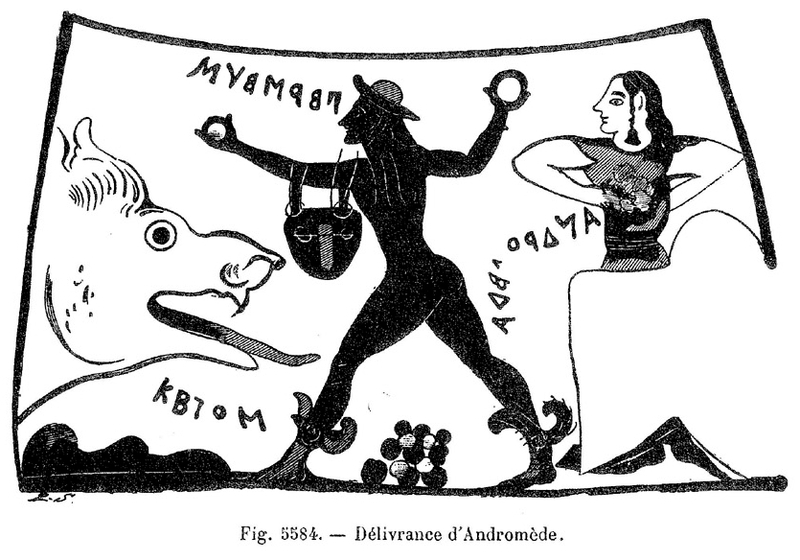 Perseus with Andromeda returned to his country. When Polydectes saw that Perseus was so courageous, he feared him and tried to kill him by treachery, but when Perseus discovered this he showed him the Gorgon’s head, and he was changed from human form into stone (original Latin). Cited in note 17 for p. 308 (incorrect no. is given for Perseus): Pseudo-Eratosthenes, Katast (Katasterismoi) 15 (Kepheus; with a mention of Euripides); 16 (Kassiepeia); 17 (Andromeda; with a mention of Euripides’ Andromeda); and 22 (Perseus) = Mythographi Graeci vol. 3.1, ed. A. Olivieri (1897), pp. 19-21 and 25-27. When Perseus son of Danae and Zeus had come to Cepheus son of Belus and married his daughter Andromeda, a son was born to him whom he called Perses, and he left him there; for Cepheus had no male offspring; it was from this Perses that the Persians took their name (original Greek). I am Echo, the nymph who repeats all she hears. It was I, who last year lent my help to Euripides in this very place. But, my child, give yourself up to the sad laments that belong to your pitiful condition (original Greek). the middle skies, with plummet-mold of lead. vainly to vent his fury on the shade. So fought the hero-son of Inachus. shunning the hounds around him in full cry. long, tapered as a fish. but now is covered by the lashing waves. sheer through the monster’s entrails (original Latin).